Since 2010, the Arizona State University Men’s Swimming and Diving team hadn’t placed higher than fifth at the Pac-12 conference championship meet. That is, until this past weekend, when the Sun Devils placed fourth, ahead of in-state rival Arizona. ASU men’s swimming has been on the rise for the past few years, but their success has catapulted since legendary coach Bob Bowman took the driver’s seat in Tempe. With Bowman’s expertise, ASU has quickly gone from absent at NCAA’s to setting up some great scoring swims for this year’s championship. Before Bowman was announced as head coach, ASU had some trouble with keeping coaches and performance. The program suffered and was cut temporarily due to budgetary constraints in May of 2008, before being reinstated that July. More than 450 individuals donated and pledged to help the cause, ultimately raising $1 million – enough to cover the cost of four seasons. Thanks to large efforts on behalf of the Sun Devil Swimming Association (SDSA) the men’s swimming team quickly rebounded and stabilized on financial ground within the first few years. The SDSA was later able to create a permanent endowment for the men’s and women’s swimming teams in the spring of 2014, helping to secure scholarships for their student-athletes. ASU had never placed higher than 16th at an NCAA championship and, beyond that, the Sun Devils have been either absent or scoreless among recent NCAA appearances. At last year’s NCAA championships ASU scored only two points, placing 46th out of 50 teams. After some heavy recruiting done by their seasoned staff, the Sun Devils have placed themselves in a perfect position to contend for a top-ten finish in Indianapolis. Their recent success has been largely due to their loaded freshman class. Twelve swimmers out of their entire roster are freshman and among those talented twelve, is now two-time Pac-12 champion Cameron Craig. 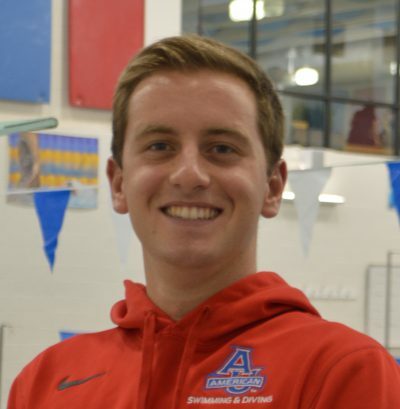 Craig won the 100 and 200 freestyles this past weekend, going 41.95 and 1:31.71, those times rank him sixth and second in the nation, respectively. The latter of the two races is probably Craig’s and ASU’s best shot at a top-eight individual finish. In addition, ASU now has several NCAA automatic qualifying standards, and even more B-cut swims that will likely be invited. Craig isn’t the only star Bowman and his gifted staff have developed this season, though. Junior Patrick Park has played a tremendous role in the Sun Devil’s recent success, especially in duel meets. In the dual meet season, ASU held a record of 4-2-1, thier best record in quite a while, with notable wins over Utah and USC. The tie came with in-state rival University of Arizona, where the Sun Devils proved they could go toe-to-toe with the Wildcats, one of the best programs in the country. ASU hasn’t just crafted a few strong swimmers here and there, they have become extremely deep across all events, which has set them up to have great relay performances. ASU showed their great versatility both in their suited-up duel meet with Arizona in early February and at the Pac-12 championships this past weekend. In both meets, ASU won the 400 freestyle relay. In their victory at the conference championships, ASU would hold off top-tier teams such as Cal and Stanford to take the win. In terms of the other relays ASU was no slouch there either. In the 400 medley relay ASU dropped nearly four seconds from their seed time to place 2nd behind the Cal Bears, a team which will likely contend for the NCAA team title in a few short weeks. ASU could very well have all five relays at the NCAA championships this year. It has been a very long time since ASU has been in the hunt with the likes of Cal, Stanford and USC. Perhaps this season will be the best season ASU has ever had. With big name recruits such Grant House and Will Brenton, ASU’s momentum does not seem to be slowing down. Could the Sun Devils make history this year? Only time will tell where Bob Bowman and his staff take this program. Jason — Great article reflecting the recent uptick in the men’s program. Thank you for the current Sun Devil swimmers and divers. Let’s please be a bit more respectful of the Men’s Sun Devil history which has been much richer than suggested in the article. While it is true the program fell into hard times in the last decade, primarily due to the legs being chopped out from under them by short sighted administrative decisions, as accurately reflected in the article, and recovery from such a position is against all odds. It is a reflection of the care, skill and pride of the Sun Devil Swim Association, made up primarily of athletes from the previous 30 years of Sun Devil swimming. In fact, ASU men have placed higher than 16th at the NCAA ,,, 21 times, including 10 times in the top 10. Their first top 15 came in 1979 and the consistency of the program produced top 10s in the 80s, 90s and 2000. Even in the years up to the program cut, though production slowed a bit, ASU placed in the top 21 every year, making a string of 29 of 30 years. They fell back to 27th-T in 1989, but the Sun Devils had the resiliency, lead by 1988 US Olympian Troy Dalbey, to jump back to their all time highest team finish of 5th the following year. In an interesting and fun parallel, the 200 free record Cameron Craig broke was set by Dalbey in that bounce back year.